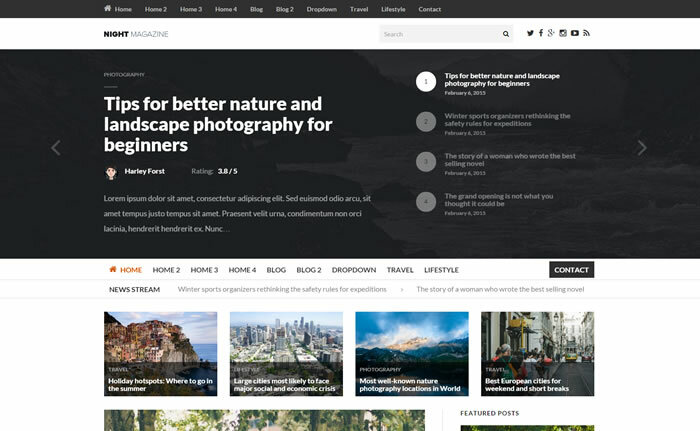 Night is premium WordPress theme developed mainly for the magazine, news and blogging websites. Its clean and modern WordPress theme comes with 4 custom home page layouts with fully responsive layout and packed with lots of features. 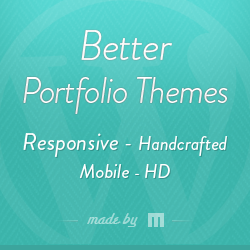 Night is highly flexible and incredibly easy to use WordPress theme customize it according to your needs. Home page layouts are widgetized which means you can organize the home page according to your choice. Night magazine / blogging WordPress theme comes with 20+ custom widgets and supports unlimited colour options. Built-in user rating system, you can selectively enable or disable this feature via theme options panel also included with Like feature (Using ZillaLikes plugin) which can be used to show the popularity of the posts. Built-in support for the rich snippet microdata rating system, it complies with schema.org microdata standards which helps search engines to understand your content and display it in a useful and relevant way. Night magazine / blogging WordPress theme included with built-in contact form and it used with reCaptcha to prevent spam. Theme combines the excellence of design and the code quality, has been tested with WordPress debugging tools to avoid any PHP notice or warning. NightMag is translation ready WordPress theme enabled to support related posts without any third party plugins.